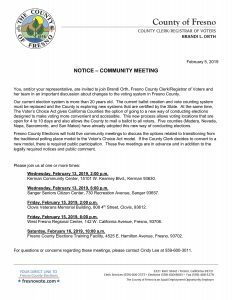 Fresno County Elections Office to hold Community Meeting on transitioning from the traditional polling place model to the Voter’s Choice Act model. Clovis Veterans Memorial Bldg Friday Feb. 15, at 2:00 p.m.
Michael Cohen pleads guilty to 8 counts! Paul Manafort guilty on 8 counts! You might be seeing or hearing an ad paid for by the campaign to re-elect Devin Nunes as congressman for the 22nd District. The Fresno Bee is the subject of his ad. Actually, his anger at The Bee is the real subject, but Nunes hides it behind wanting to protect what he calls a family owned winery and vineyard. Contact Jeni Kren at (559)322-9740 or Email to clovisdemocraticclub@gmail.com regarding the Club or this website. Monthly Club Meetings are held on the 3rd Thursday of each month beginning at 6:00 PM. Come early to enjoy dinner. Business Meeting begins at 6:15 PM with the program at 6:30. Meetings held at the Seven Restaurant, 25 Shaw Avenue, Clovis, CA. Everyone is welcome.